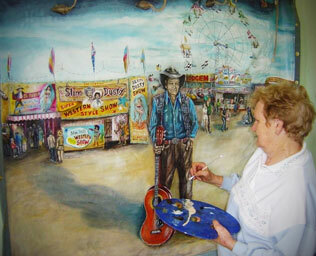 CarnivalArt.com.au features the work of artist Norma Brophy who spent a lifetime travelling the Australian show circuit. Norma has captured many images of the life and times of Australian carnivals using a real circus tent as her canvas. The tent was originally used by Brophy Bros. Circus and became the basis of Norma's artwork from 2002, using on the outer rim of the marquee and incorporating the lacing ropes, eyelets or webbing into each painting. Limited Edition prints of the original paintings are available on art canvas and can be viewed and purchased on this website.